A Product Development Predicament: Build from Scratch or Reengineer What you Got? 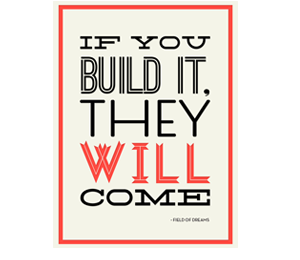 Home / Insights / Blogs / A Product Development Predicament: Build from Scratch or Reengineer What you Got? “If you build it, they will come.” In the movie Field of Dreams, actor Kevin Costner hears a voice telling him, “If you build it, they will come.” Heeding the words in his head (I would have gone to a psychologist), he built a baseball field in his backyard. Long story short, (SPOILER ALERT) he saved his farm that he built the baseball field on, baseball greats from the other side of the living world came to play on it, and people came across the country to watch. What does all of this have to do with product development? In product development, we constantly ask ourselves if we should build from scratch (like Kevin Costner did) or if we should leverage existing SDKs/APIs to speed development work. At 3Pillar, our product strategy team looks at a multitude of information before recommending that our clients either build from scratch or leverage something else to build upon. More often than not, the decision lies within our client’s business objectives and which route helps them attain those objectives. 3Pillar is a product development partner, which means we do what is best for you and your business. It would be simple to bill our clients more and build everything from the ground up, but we understand that our clients’ success is our success. We build and advise as if our clients’ products were our own brand and product. For instance, Carfax needed a way to quickly retrieve the VIN numbers off of vehicles. 3Pillar could have recommended that we build the functionality from the ground up, perform research around how to best capture the VIN, and then finally take the time to develop and debug a custom solution. By doing the ground up approach, Carfax would have spent more time and money, which would have meant increased time-to-market. 3Pillar, in being product partners, presented another option to Carfax. We recommended that they leverage an existing technology of using the camera to read the VIN number. The 3Pillar team leveraged an existing SDK and integrated it into Carfax’s mobile application much faster than we would have been able to if we built it from the ground up. There are, however, instances where leveraging an SDK or API is not in our clients’ best interest. In those cases, 3Pillar presents all options and facts to help the client understand why 3Pillar chose this route (because more often than not, building from the ground up takes longer, creates more risk, and costs more). Sometimes it’s worth clearing the cornfield to build a ballfield, if it’s what the client needs. One example of this was when a client of 3Pillar wanted the ability to mine data from any website on the internet for product information. While 3Pillar could have leveraged one of several APIs and website crawlers/parsers on the market, we knew that what our client was looking for was more complex and custom. 3Pillar understood that data was the crux of the product and while it would have been easier and faster to market by not building from the ground up, the quality of data would not have been up to expectations for our client’s clients. In the end, 3Pillar created a very complex crawling and parsing process to be able to analyze a website, extract and store data points on all products listed on the site, and to have the process recur without acting as a Denial of Service attack. There are times when building from the ground up is necessary and times when leveraging another SDK or API is a must. The decision is never all black and white. Just like Ray Kinsella needed to know that Terence Mann saw Moonlight Graham’s name on the scoreboard at Fenway Park before he was willing to “go the distance,” you may well need a product partner that can provide strategic thought to confirm your beliefs about how to reach the best outcome for your product and your business. Brian Oh is a Product Manager at 3Pillar Global. He has successfully launched several products ranging from large scale SaaS products to quick turnaround iOS and Android applications. Prior to joining 3Pillar Global, Brian was heavily involved in the Federal Government sector with Booz Allen Hamilton, SAIC, CGI Federal, and Ernst & Young for the Department of Homeland Security, Department of Defense, Administrative Offices of the US Courts, and Veteran Affairs, respectively.